Sciatica Piriformis Syndrome, the most common cause of sciatic pain is created when pressure is placed on the sciatic nerve by the piriformis muscle which is situated very close to it. Muscle imbalance is the most common underlying cause of this condition and the resulting sciatic pain. Muscle imbalances pull the hip joints and pelvis out of place (remember, the bones do not move on their own) and this changes the positioning of the piriformis muscle, in relation to the nerve, which then places pressure on the sciatic nerve. The area gets inflamed and then spasms cause pain. 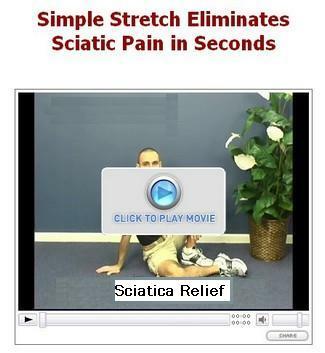 Sciatica piriformis can only be really corrected by addressing the cause - typically a muscle imbalance. Just treating the symptoms will not solve the problem. 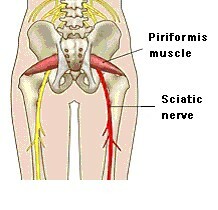 In 15-30% of the population the sciatic nerve passes through the piriformis muscle, rather than underneath it. These people have been reported by some studies to have a greater incidence of piriformis syndrome than does the general population. 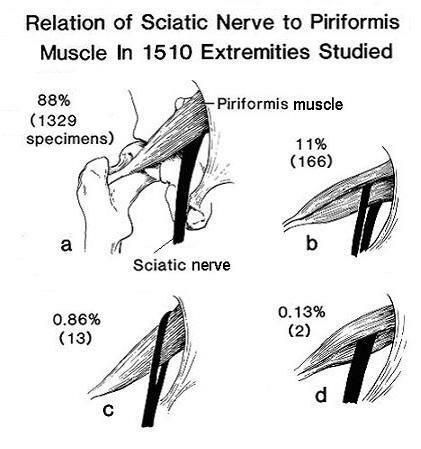 In one study, in 88% of cases examined the sciatic nerve was under the piriformis muscle (a, in diagram below). In 12% of cases (b, c and d), it went through or around the piriformis muscle. Whatever the arrangement, muscle imbalances will cause major problems and are the underlying cause of sciatica piriformis. In people that sit all day at work the hip flexors become short and tight and the gluteals are inactive and become weak. This can contribute to the piriformis having to do extra work to compensate resulting in hypertrophy of the piriformis. With an approximately 40% increase in piriformis size, sciatic nerve impingement is inevitable. 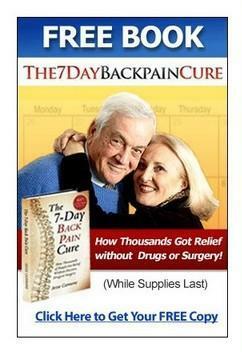 Then you have piriformis syndrome and sciatic pain. Piriformis syndrome is also known as "wallet sciatica" or "fat wallet syndrome," because it is aggravated by sitting with a large wallet in the rear pocket on the affected side.